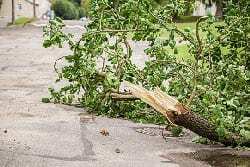 The extreme climate in the country requires Canadians to be prepared to face damaging natural events such as storms, heavy rains and gusting winds that can cause damage to your home and property, especially your trees. Professional arborists often recommend tree removal after a storm to help minimize further damage. Crown Twist – The branches near the top of the tree and the trunk get warped, split or cracked. Blow Over – The trees get pushed about due to the wind, causing their trunk to break. Damage to the Branches – The limbs break off from the trunk and get trapped in the remaining branches or fall to the ground. Damage to the Roots – When the roots are not properly anchored in the ground, it may cause complete uprooting of the tree. Make sure it is safe to approach the damaged areas. Look for fallen power lines and loose tree limbs and stay away from them. Evaluate the damage to your property to decide the further course of action. Check the roots to find if they are firmly rooted and assess the tree’s integrity. Most large limbs are uninjured. The bark hasn’t suffered significant damage. At least 50% of the branches are unharmed. There are no indications of rotting. Cut off the damaged limbs that may pose a threat of falling. Prune the trees and plants properly to prevent insect invasions, avoid diseases, and other similar problems. Take the required steps for tree removal if it is irreparable. Clean up the remaining debris including hauling off the larger parts of a tree. A big storm doesn’t necessarily mean your trees will be damaged. Be proactive before a storm hits and get the help of professionals to determine which trees may be a problem in the future. In addition to this, they will also check the trees for diseases and potential root problems to help minimize the damage when a disaster occurs. 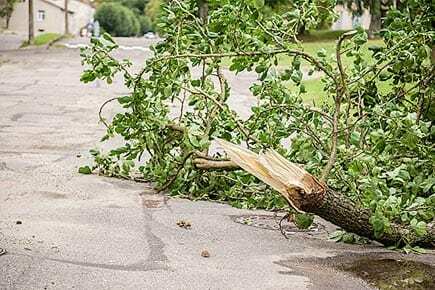 Although you can perform an initial assessment of the property, it is recommended to call for expert assistance for help with tree removal after a storm. This is because the damage to trees is not always visible. It takes an experienced eye to determine if tree removal is the ideal option. At DreamWorks Tree Services, we have qualified arborists available to provide tree removal services in Newmarket and other regions in the GTA. We also offer 24/7 emergency tree removal services. To ascertain whether the trees in your property are healthy and do not pose a serious threat, reach out to our experts by calling 647-793-8903 or toll-free at 1-800-407-9917. You could also fill out our online form to get a free assessment.